Recommendation (1) is much too weak. Customers must be forced to change passwords during initial setup. This HMI panel is well configured. For access e.g. to the files a login to the system is required. With this, rule (1) above will not prevent any attacks on IIoT devices. Customers must be forced to change passwords as soon as the device network adapter is powered up and connected to the company network or the internet. This entry was posted in Opinion, Survival tips and tagged Force password change, HMI Panel, ICS Security, IIoT Security, Industrial IoT Devices, OWASP IIoT Project, Security by design on November 27, 2016 by Klaus Jochem. 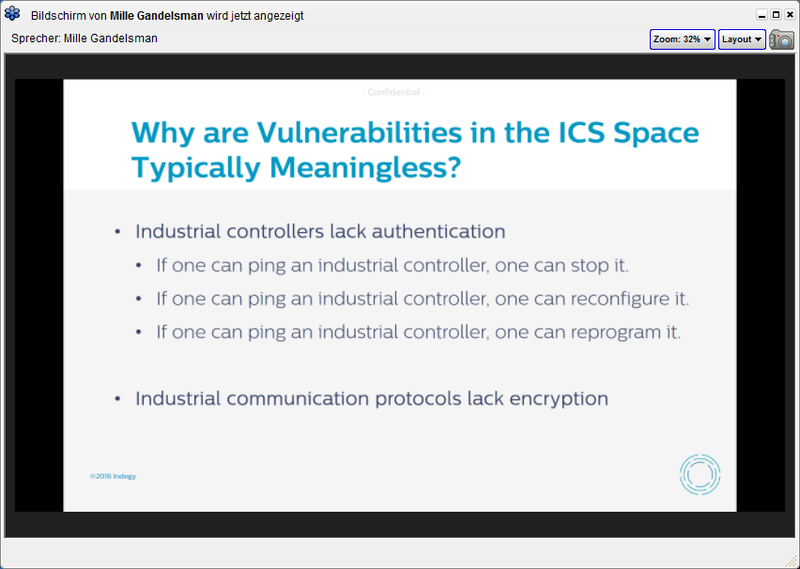 On Wednesday I watched the Indegy webinar “How a new PLC Simulator vulnerability can compromise SCADA/ICS networks?“. The webinar dealt with a recently detected vulnerability in a simulator software. Simulators are used for verification and validation of changes to process control systems (PCS) before the changes are applied to the PCS. If the changes passes the tests it is very likely that the changes will have no negative impact on the PCS and thus to the safety of the process. Simulators are executed on the Engineering Station which is directly connected to the control system and to the production network. PCS are very specialized realtime industrial computer systems. All PCS are lacking of the security features we know from the office IT, e.g. authorization, authentication and malware protection. With this, the isolation of the Engineering Stations and the PCS in separate network zones is the key to security in the ICS domain. Access to these networks must be limited to authorized staff and through few strictly controlled access paths. And with this, the first commandment of the Office IT Security, “Thou Shall Patch“, becomes less important in Industrial IT (OT) Security. “Thou Shall Isolate“, across the entire OSI stack, is the first commandment of OT Security. Have a good weekend, and enjoy the webinar. This entry was posted in Opinion, Survival tips and tagged Indegy, IT Security, OT Security, PCS, Process control systems, SCADA/ICS networks, vulnerabilities on November 12, 2016 by Klaus Jochem.